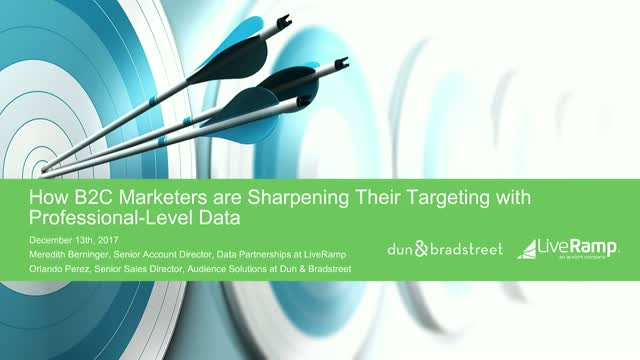 LiveRamp and Dun & Bradstreet have partnered to enable marketers to combine both consumer and professional-level data for the most accurate of customer targeting. With over 400 pre-defined segments to choose from in the business, professional and predictive targeting taxonomies, Dun & Bradstreet (D&B) curates the world’s largest commercial database including 280M+ company and 80M+ contact records with to over 250M+cookies and mobile IDs. Online and offline data are combined and run through a vigorous quality assurance process, ensuring that the data is based on facts, not guesses. D&B data sets are available to search and browse directly in LiveRamp’s IdentityLink Data Store. Marketers can search by keyword, filter by permitted use cases, view estimated reach, and seamlessly distribute audiences directly to the platforms of their choice. Truth: Your customers’ professional attributes are just as important as their non-professional attributes. Career paths speak to who a person is - to their values and interests. When you know what someone does for a living or the company they work for, you have a better idea of their intentions and life trajectory. But these consumer insights are often forgotten when the marketing campaign is built and executed, which leaves money on the table.